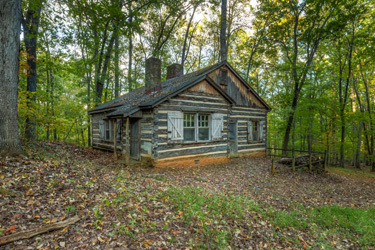 The Outing Cabin is a primitive log shelter built in the 1930s by Sweet Briar students seeking a restful place away from the main campus. Today, students, faculty, staff, alumnae and their guests use it for the same purpose: a rustic retreat in the woods. It is about a .25-mile uphill hike to reach it from the parking area. The cabin has no running water or electricity and is outfitted with a table, chairs, cast iron wood stove and wooden bunks. The cabin can comfortably sleep about 12 people, with eight in the bunks and four on the floor. The central feature is a beautiful stone fireplace, perfect for cooking over. The Outdoor Program provides sleeping bags, sleeping pads, stoves, pots, pans, lanterns, water jugs and anything else you may need for your stay at no cost. Due its remote location and primitive accommodations, users must be certified through the Outdoor Program to stay in the cabin. Certification clinics are offered each semester; see the Outdoor Program Events Calendar for scheduled dates. Additional sessions may be provided upon request if enough people are interested. Outing Cabin certification is good for life, and only one person in your group needs to be certified. Request reservations by emailing your desired dates to sbcoutdoors@sbc.edu. There is no rental fee for students, faculty, staff and alumnae. There is a seven-night maximum per stay.